What is a Bik﻿e Rodeo? 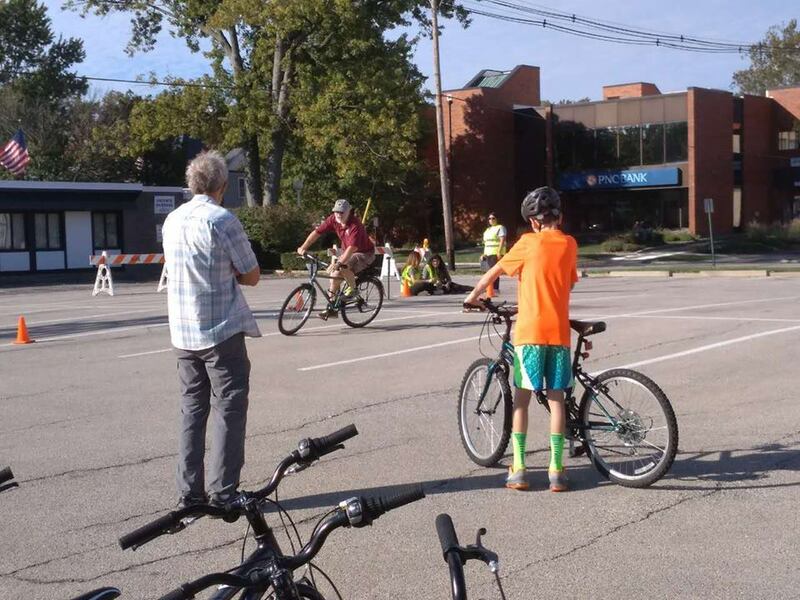 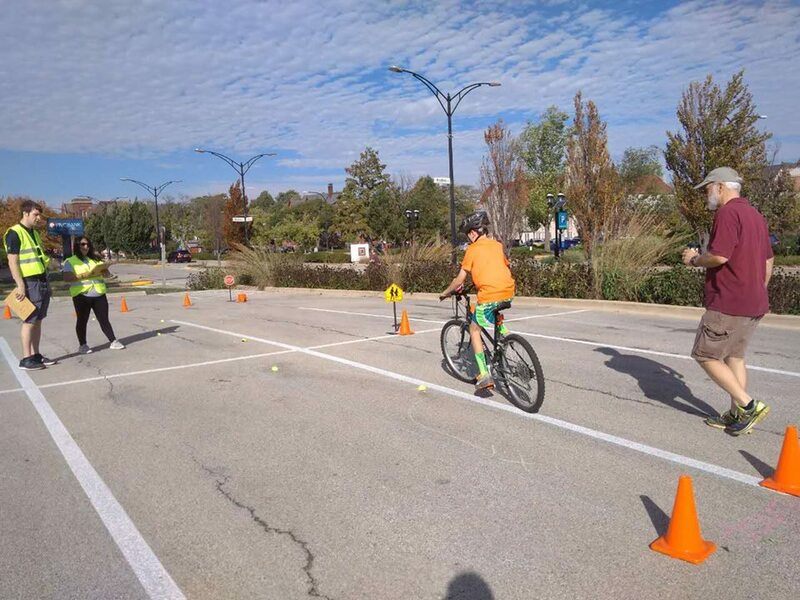 A Bike Rodeo is a bicycle skills event that provides an opportunity for young bicyclists to practice and develop skills that will help them to become better bicyclists and avoid typical crashes. 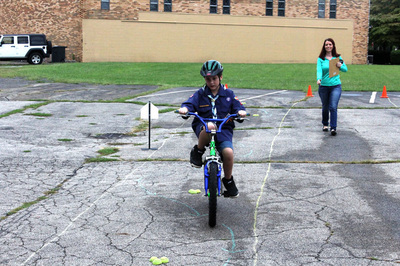 Who is a Bike Rodeo for? The main focus of a Bike Rodeo is teaching cycling safety to young cyclists ages kindergarten to 14 or so. 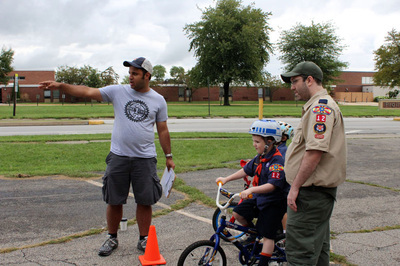 What happens at a Bike Rodeo? 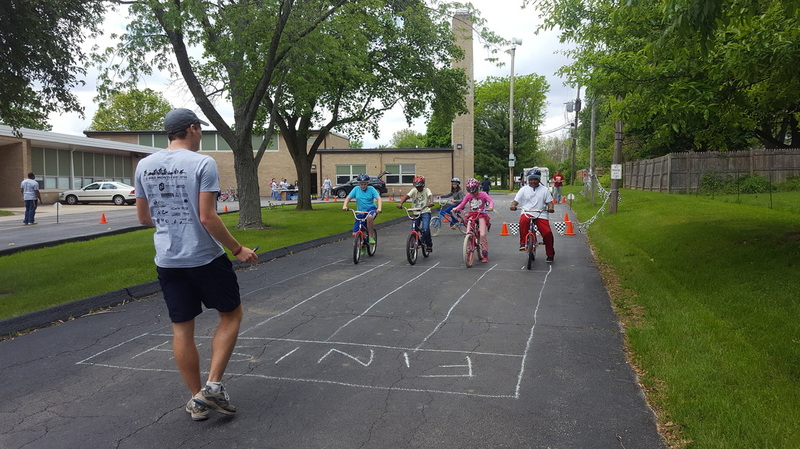 The goal of any Bicycle Rodeo is to provide an opportunity for the participants to learn, practice, and demonstrate their bicycle handling skills in a fun, noncompetitive atmosphere. 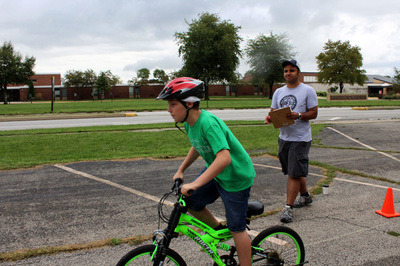 An evaluator provides immediate feedback to the participant in a positive manner (satisfactory; needs improvement), and if the child has difficulty with a particular lesson, he or she has the chance to keep practicing. 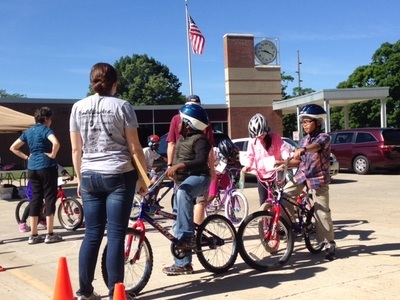 The C-U SRTS PROJECT has conducted Bike Rodeos for various schools and civic groups in the community. Want to host your own bike rodeo? 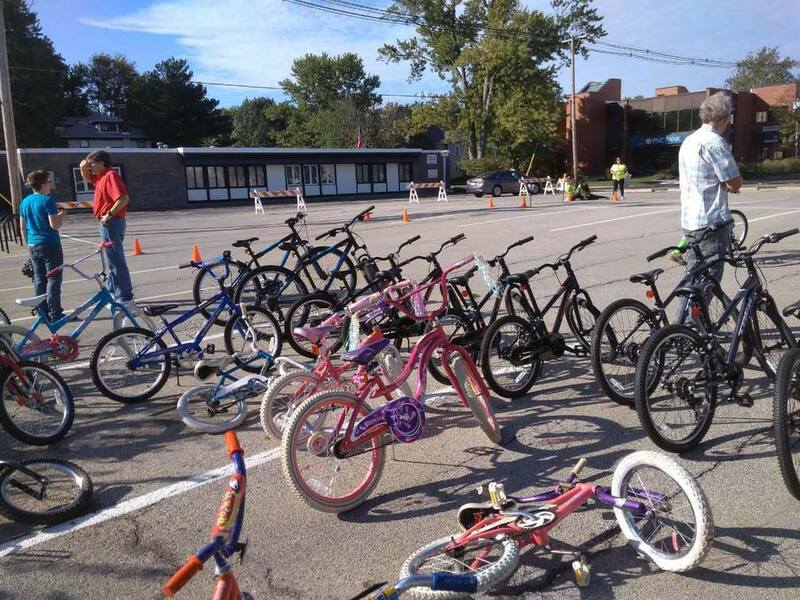 C-U Safe Routes to School can help you organize a bike rodeo! 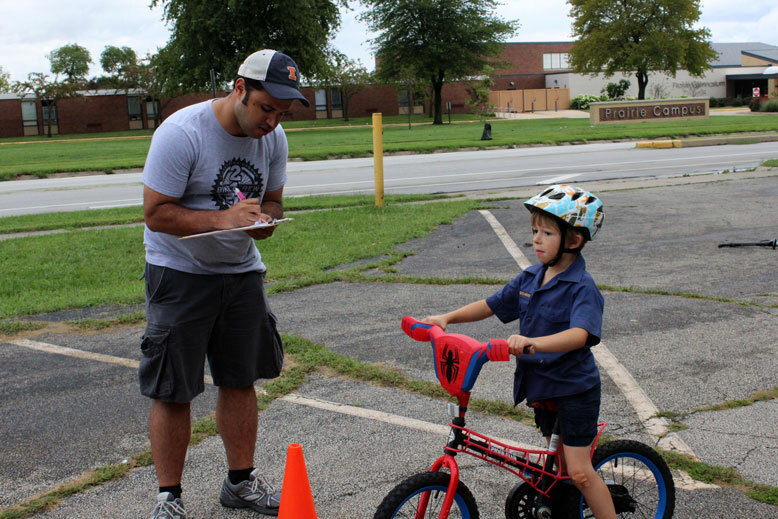 Contact us at cusrtsproject@gmail.com.We ask that organizations that would like to hold a bike rodeo provide an appropriate space and recruit volunteers to help run the event. 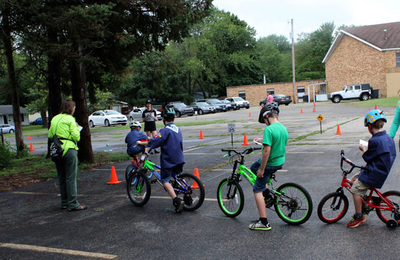 A big annual event in Champaign-Urbana is Carle's Playing It Safe Day right before summer begins. 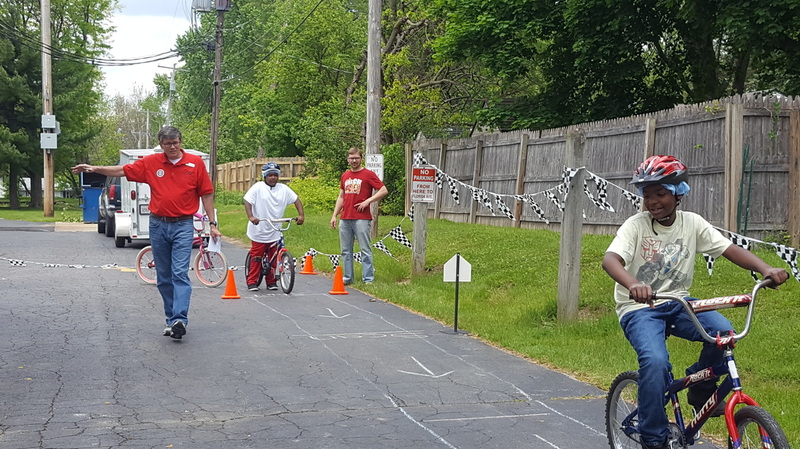 Playing It Safe, isCarle's free annual safety fair, featuring more than 50 activities and exhibits that focus on safety awareness for the entire family. 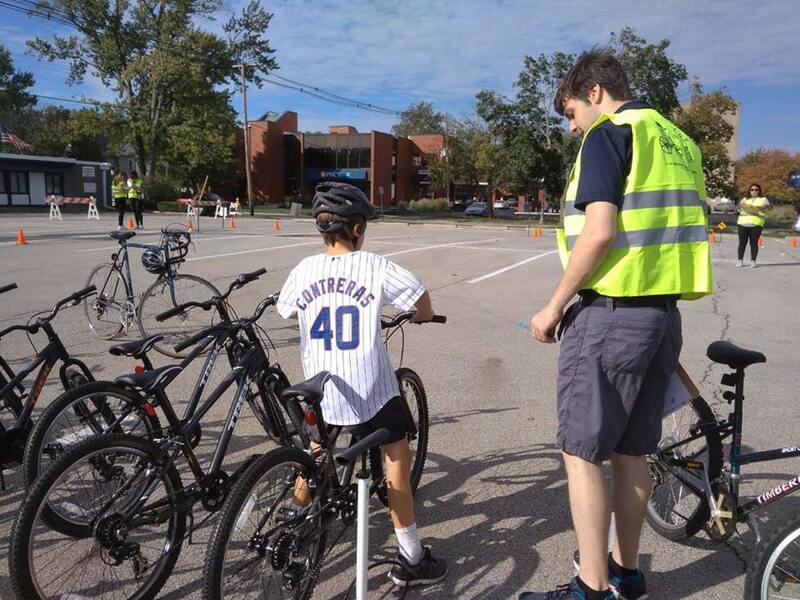 One of the biggest activities is the C-U SRTS Project Bike Rodeo. We had over 100 children go through the bike rodeo this year and learn new safety skills. 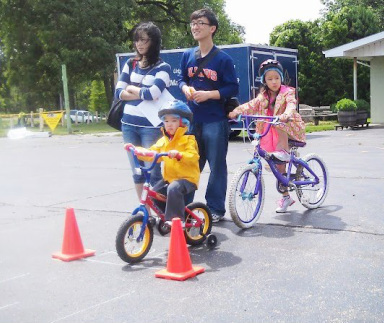 Kids and parents had fun. We were also featured in a WCIA story and in the News-Gazette. WCIA interviewed Cynthia Hoyle, Chair, C-U SRTS to School Project about the bike rodeo and bicycle safety. 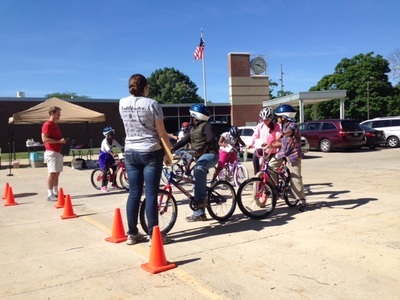 Market at the Square bike rodeo in 2017 had 5 children go through the skills course, sales of 6 helmets, and 12 volunteers. 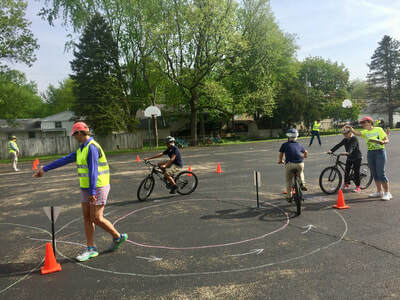 Each of the kids learned a few new techniques. It was a great experience for both students and volunteers to enjoy the fun of practicing bicycle skill in a beautiful Saturday morning. 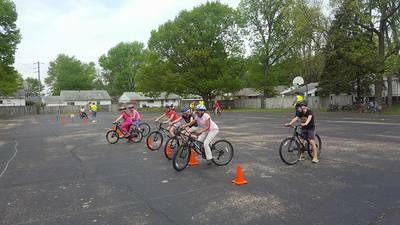 May 22, 2017 -- 77 students joined us in Spring Fling Bike Rodeo, the biggest bike rodeo in Bike Month, 2017. 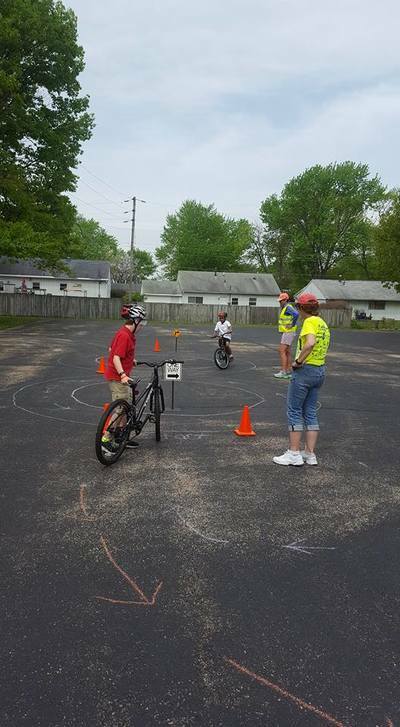 We had eight stations for them to practice basic biking skills including starting and stopping, rock dodge, scanning, signaling, turning and yielding. 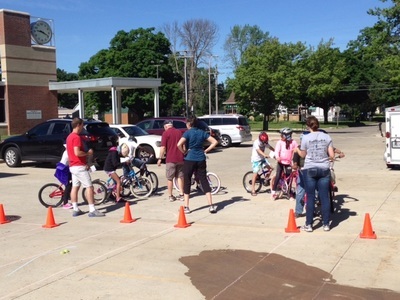 Thanks Champaign County Bikes and all the 12 volunteers for helping with this fun event. June 8, 2016 -- The King Elementary Summer Program welcomed SRTS Wednesday morning. 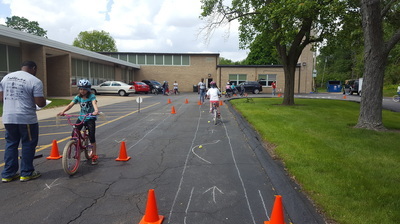 The bike rodeo was focused on 20 third, fourth, and fifth graders in the summer program. There were plenty of skill stations for students to practice their bike riding abilities outside, and students went inside for a Melon Drop that showcased the benefits of wearing a helmet while riding a bike! 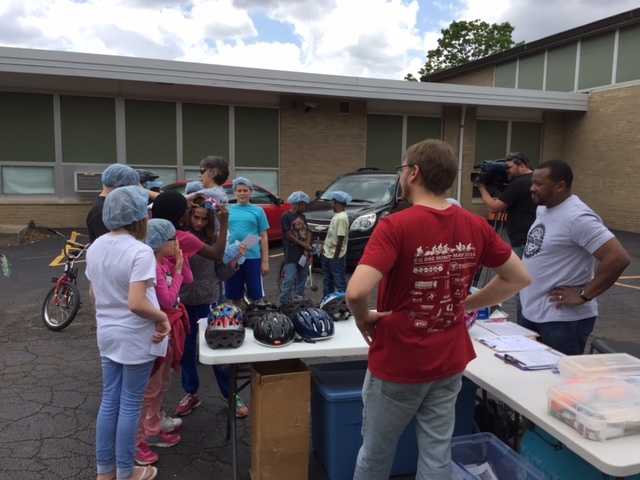 It was a great experience for both the students and the volunteers who got the privilege of working with these great kids. May 18, 2016 -- Great weather welcomed 30 students from Wiley Elementary outside to participate in a bike rodeo. 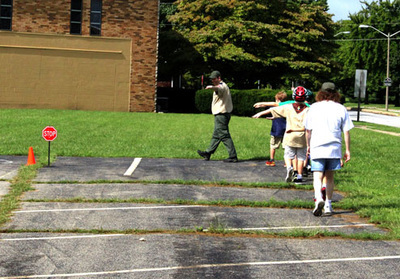 The students got the opportunity to show off their skills along a course that included obstacle avoidance and snail races. 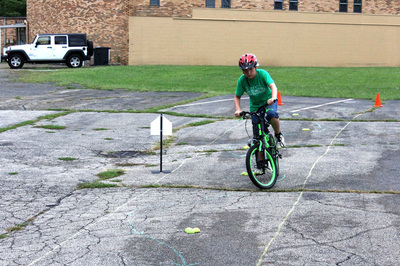 Even the experts of the group were able to learn a thing or two about bike riding techniques! 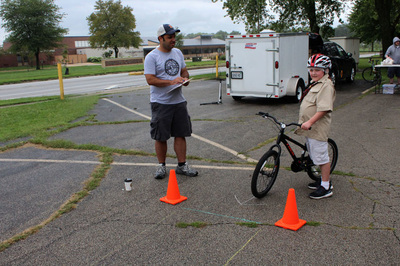 For more great pictures of the bike rodeo, you can check out our Facebook page! 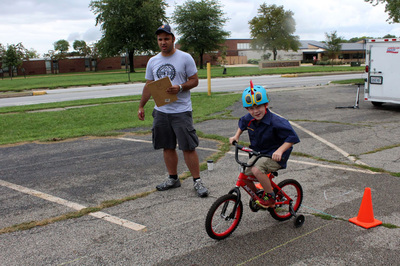 Check out the archives from each year to see photos from past bike rodeos. 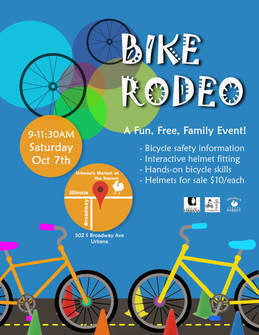 Look for C-U SRTS Project flyers online and around town advertising upcoming bike rodeos.